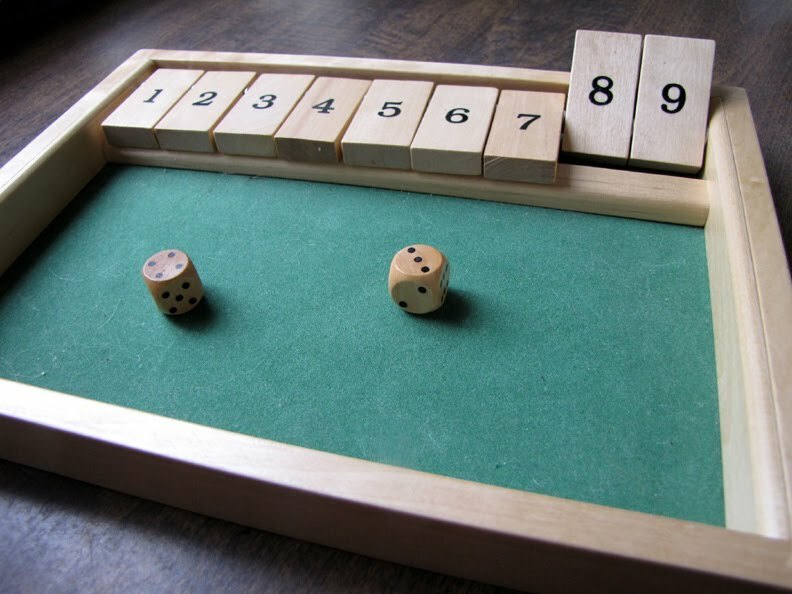 We have a little wooden game called “Shut the Box”. I like little wooden games. ‘Natural fibers’ kind of girl. You know. Even though we bought it new, and not used, the game didn’t come with any instructions. We just opened up the cardboard, and there was a wooden box with two wooden dice. I am not sure that’s the way it was supposed to be…. but it didn’t turn out all bad. Using your head to make up games isn’t exactly a waste of time, is it? Maddie (four years old for a precious few more days) is getting more and more willing to play full-length games with us. There are some that we know she’ll drift into and out of, and we figure she’s allowed. Yesterday the three of us – the children and I- played dice games. roll two dice, and you can push down the tab of that number, or two of it’s parts (meaning that if you roll an 8 with a 2 and a 6, you can shut 8, or 2 and 6, or 5 and 3.
add up your remaining score, and compare it to the next player’s. Or something like that. I can only guess and speculate, of course. Yesterday’s version happened quite organically, with no plan or intention… Maddie just picked up the dice, rolled them – a 1 and a 2 – and she simply shut the 3 box. Just like that. Trev picked up the dice, rolled, and shut his boxes. I rolled, and shut my total. It got down to the last two boxes – 8 and 9, and I was able to shut the 8. “Now we’ll just play, and whoever shuts the nine wins!” I said spontaneously. After one more round, Trev rolled a four and five. Just like that we have a fun new game. For us this version worked well, as there weren’t long bouts of “this is really a quiz, so add up this long list of numbers”… Maddie was able to count dots (and get practice recognizing numbers), and it moved fast enough that it didn’t get tedious or boring… or feel like work. Don’t have this wooden game? List numbers on paper, and cross them off! For other variations, see this post.